The first day my Dad joined me on the boat, we went from Wrightsville Beach to Calabash River on the border between North and South Carolina. On the whole, it was an easy forty-five mile day, though we did have a little bit of stress passing through Snows Cut and coming into Deep Point Marina for gas and a pumpout. But the most challenging part of the day was anchoring at the end of it in the narrow confines of Calabash Creek. 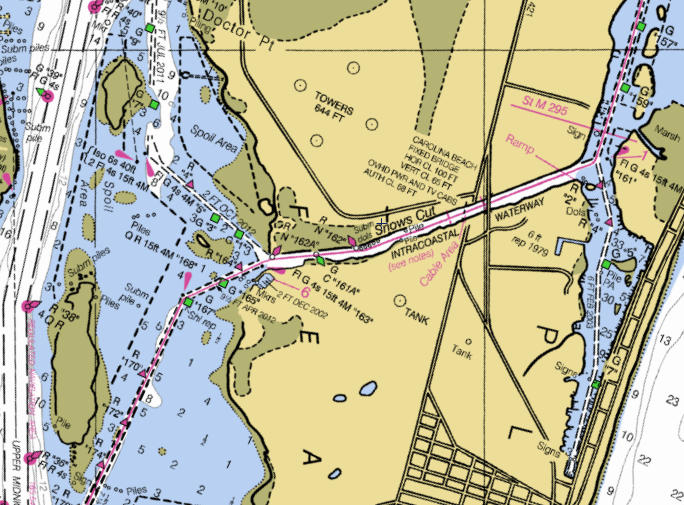 Concerned about the reports of a rock jetty, underwater at high tide, in Snows Cut and some shoaling around that area, we planned to hit the pass into the Cape Fear River an hour or two after high tide. 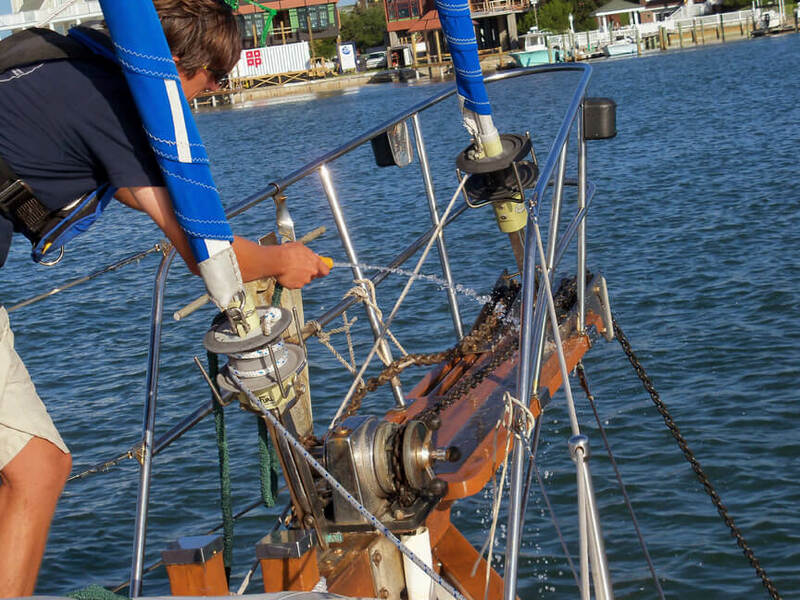 Given that schedule, we waited until 8:30 in the morning to pull up anchor in Wrightsville Beach. After waving goodbye to the couple alongside us who had just completed a circumnavigation, the ten miles down to Snows Cut passed easily as my Dad got acclimated to being underway on Bear. As we approached Snows Cut, the current was pushing hard against us as the tide flowed out Carolina Beach Inlet. In the cut itself, there were some menacing looking boils on the surface and a number of people fishing from both the shore and small runabouts, crowding our passage. After we passed under the bridge, we stayed alert, looking for the rocks that supposedly extended a third of the way out from the north side. Though there was no shortage of current and floating debris, we never saw the rocks as we stayed safely towards the south side. Coming out onto the Cape Fear, the wind picked up, funneling up the river. At the same time, the tide ripped out, creating a short yet steep wind on current chop. Dealing with the chop while continuing south in the Intracoastal Waterway, we had to carefully watch the markers both forward and aft so that the current did not push us too far south and out of the narrow channel. It was one of those many moments along the ICW that feel fairly perilous at the time, but in hindsight seem easy, partly because they actually were simple and partly because our caution allowed us to pass through without incident. As we head north next year, I am going to practice the art of relaxed vigilance, stressing less, but still embracing the navigational challenges. 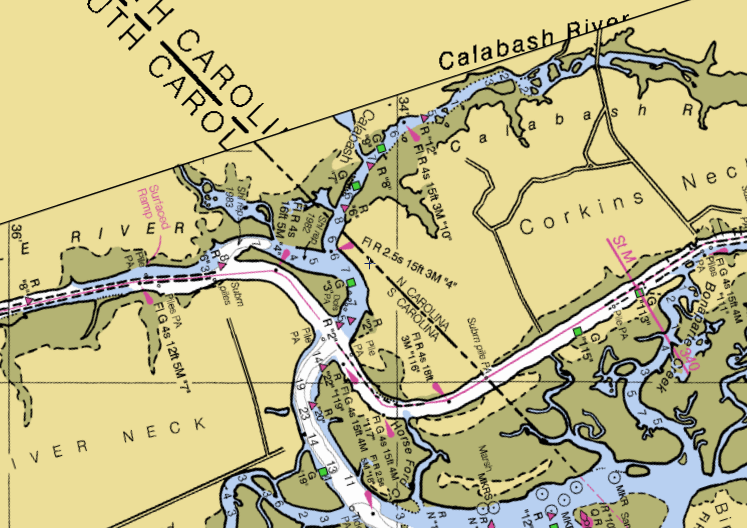 Once in the main Cape Fear River channel, the current pushed us along even faster as we picked up buoys and avoided the restricted area around Military Ocean Terminal Sunny Point, which is a long name for the largest military terminal in the world and the main point of departure for ammunition leaving the East Coast. Disappointingly, not much is visible from the river and there were not even any patrol boats about. Of course, we were still aware that we were probably being watched the whole time. Before long, we were approaching the entrance to Deep Point Marina, where we planned to refuel and pumpout. As we started to come abreast the cut into the basin, I pointed it out to my Dad, then handed him the helm so I could get the fenders and docklines out. Within seconds, he was telling me he did not think we were going to make it in. I looked up to see us pointed well south of the green marker, having been swept past the entrance by the stiff current. Exasperated, I muttered something about needing to actually aim for the entrance, retook the helm and, accounting for the current, again pointed us towards the break in the shoreline. Quickly, we passed the threshold of the basin and were free of the current. Deep Point is also extremely well protected from the wind; notwithstanding the 18 knot breeze just a few hundred yards away on the river, there was nary a ripple on the water’s surface inside. With the calm conditions, we made a left turn and came alongside the wharf like pros as the dockmaster took our lines. After setting us up with everything we needed, the dockmaster left us alone to take care of ourselves. 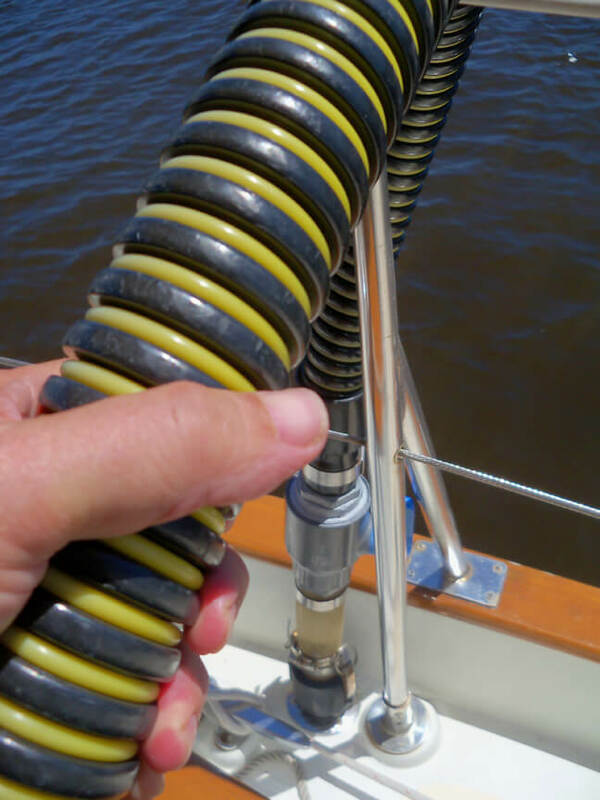 And, as the ferry to Bald Head Island loaded passengers on one side of the basin, we too advantage of the deserted fuel dock to rinse the decks and really flush out the holding tank with some freshwater. 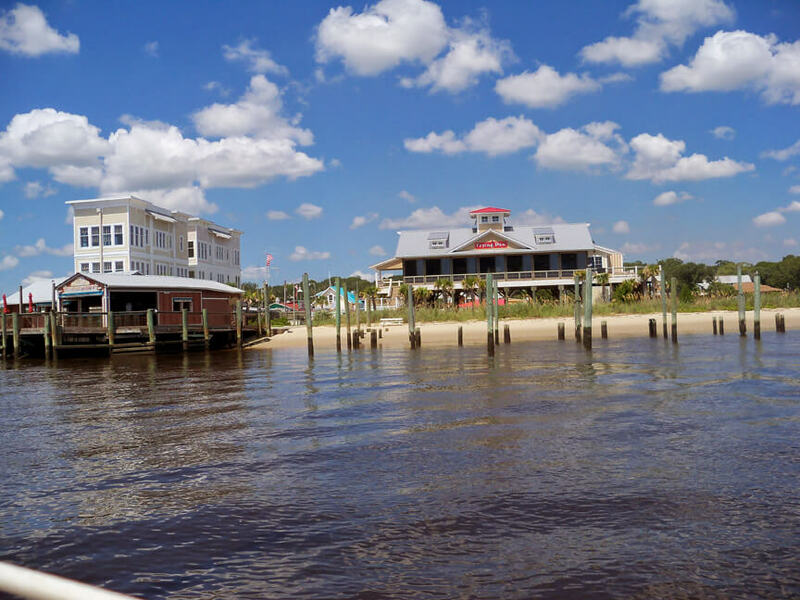 Back out on the river, we soon left the Cape Fear River, continuing south on the ICW and passing the town of Southport. With pleasant looking homes and quite a few waterfront restaurants, Southport looked like a great place to stop for the night. But we were intent on making some more distance and continued southward. The rest of the afternoon consisted of a pleasant and uneventful cruise past countless long docks leading to large homes, occasional stretches of open marsh, and numerous inlets, causing our speed to vary dramatically as we road and then bucked the tidal current. 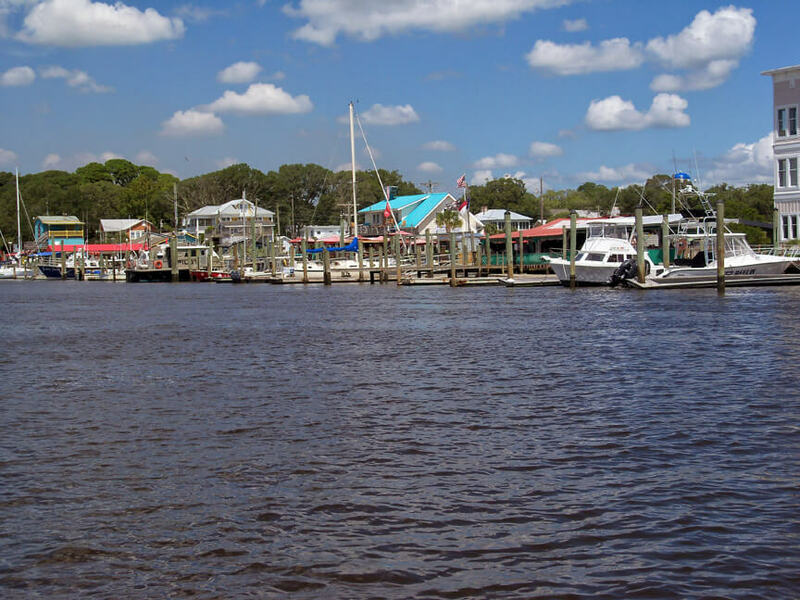 Finally, we reached the last sweeping right turn and the entrance to Calabash River, our anchorage for the night. Entering the creek, we stayed close to the ICW’s R “2” marker, as folks on ActiveCaptain suggested. Near low tide, the water quickly shallowed, but we still saw eight feet as we passed over the bar at the creek’s mouth before it deepened again as we slowly began heading upriver. 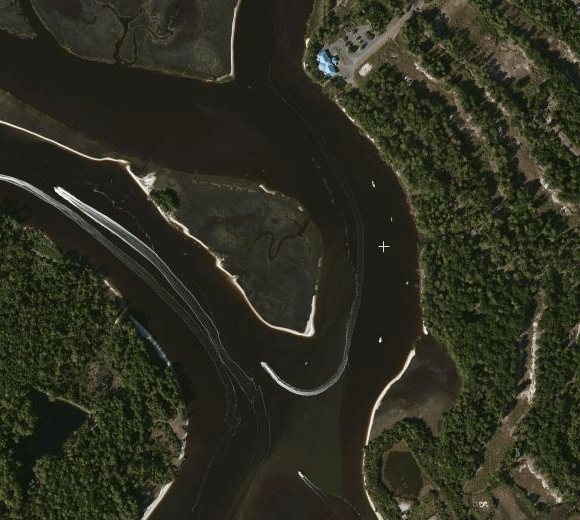 We scouted the north side of the channel from slightly above Calabash’s R “2” to just below the house at R “4,” finding more than seven feet nearly to the bank. Concerned about swing room, we eventually dropped the hook northeast of G “3,” letting out about eighty feet of chain. We were probably fine, but the anchorage was incredibly tight. As I used the chartplotter in an attempt to ascertain how far we were from the green marker, my Dad provided the first of his incredibly accurate distance estimates, saying we were a long five iron from the daymark (translation: about 120 yards). It still felt cramped despite being the only boat there. I can only imagine what it would be like when there was a squall passing through the anchorage with eight or ten boats at the height of the spring and fall migration. Still, there is really nowhere else to anchor if, like us, you want to get an early start on the Rockpile and make it to Georgetown the following day. Yes, there were several times that my being at the helm caused Jeff to mutter in frustration. 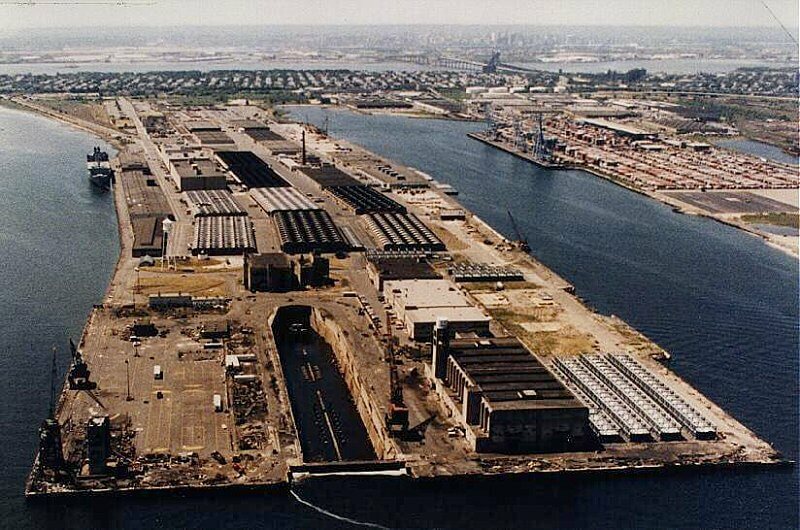 I am surprised that only this one incident getting into the Deep Point Marina was documented. My only response is that my experience at the helm is very limited unless you count being at the rudder if a 14′ Sunfish or an 17′ Boston Whaler. I also have to report that it is my 8 iron is what I hit 120 yards. I am not a very good golfer nor am I one that hits it long, but my 5 iron does go 145 to 155 yards. Southport was one of those waterfront towns that really interested me with its restaurants and homes as being one place that I would like to return to visit. Also Bald Head Island is very appealing.